Huawei has just launched its new flagship smartphones, the Huawei P30 and P30 Pro. 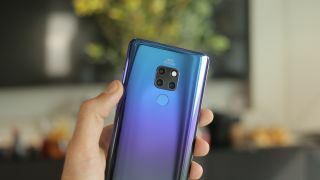 But there was no mention of a 5G version, despite competitors like Samsung and Xiaomi launching the Samsung Galaxy S10 5G and Xiaomi Mi Mix 5G respectively as 5G spin-offs of popular handsets – but the Huawei Mate 30 could be different. Speaking at the P30 launch event in Paris, the executive director CEO of Huawei's consumer business group, Richard Yu, said the company was “considering” putting 5G on the next series of Mate phones, adding that the P30 and P30 Pro didn’t have it due to the fact that 5G networks are still under construction. What do we know about the Samsung Galaxy Fold? Are 5G phones the future of mobiles? Currently several Korean service providers are working to create a 5G network in the country, which would make Korea the first place in the world with such a network; Verizon in the US and EE in the UK are working to bring 5G to selected cities. Yu said he believes 5G will be ready by the end of the year, “ready for the Mate series”, which will likely launch after the Huawei Mate X foldable phone, which we’re expecting to see in June-August this year. The Mate X is also expected to have 5G connection, so it’s looking likely that it’ll be the first Huawei device to launch with the connectivity, as we’re expecting to see the Mate 30 in October judging by past release dates. The Huawei Mate 30 release date is still a long way away, and there’s still a lot we don’t know about the phone – stay tuned to TechRadar for all the latest news, rumors and leaks about the phone, as well as the Mate X. Why have so many 5G phones been launched this year?